I have this weird relationship with setting goals. It’s not something that I do in the typical, structured way that most people do. In fact, I tend to resist the concept at every turn. There is something in there that runs counter to my way of letting things happen and going with the flow of life. And it’s not like I don’t aspire to things – on the contrary I have huge aspirations in my life. I just have been resistant to putting timelines and structure around these aspirations. Last month in Sarah Robinson’s 28 Days to Getting Your Sh*t Together blog series, I was actively engaged in every post until the one on setting goals. I went silent. I suppose I don’t like being told that I need to set goals. But guess what? I do. 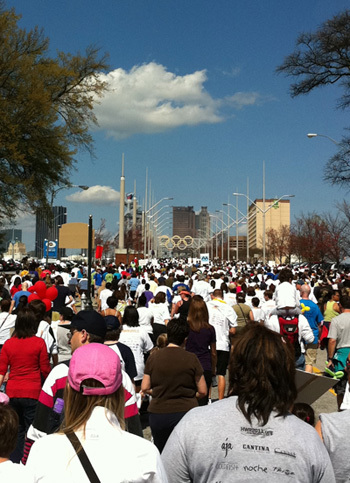 On Sunday afternoon, I participated in the Hunger Walk here in Atlanta, which benefits the Atlanta Community Food Bank. I’ve been participating in Hunger Walk for several years, and I sit on the Advisory Board of the ACFB, so I definitely have to step up my game around raising money for this initiative. This year, I set the bar even higher than last year so that I would continue to push myself. The team I formed with Hub Atlanta quickly picked up a couple of eager members, one of which blew past me in fund raising within the first day or two. At the end of last week, I was staring at the team dashboard and looking at my relatively weak fund raising total and the impressive total of my new teammate, and I started to feel like I had failed. There I was, the team captain, on the Board of the ACFB, and I was nowhere near the goal I had set. Immediate action was required. To be fair, I had already posted this to my blog, my Facebook page, Twitter account, LinkedIn, etc. I had recruited several people to join me in raising funds. So it’s not like I was slacking or anything. It’s just that I needed to really buckle down and put the word out for the final wave of support. Friday, 2 days before the Walk, I sent out some targeted emails to those who I thought would be most likely to respond with a donation. I posted the blog entry yet again to Facebook and Twitter. This time around, something clicked – donations started pouring in. Throughout the weekend and even into Monday people were donating to my team. We went way beyond our fund raising goal, which was so nice to see! We raised just over $2000 for the Atlanta Community Food Bank, which is $500 more than the goal I originally set for the team. Yeah! There are definitely some lessons in this story; lessons I need to keep fresh in my mind. First of all, setting goals has its time and place. This is a great example of why goals are important for achieving a specific target with a date/event associated with it. Had I not planted the flag in the ground early on, I might not have had the fire lit under me on Friday to jump to action. Second, posting passively to social media doesn’t always inspire immediate action. It’s not that social media isn’t effective for generating donations, but we have to remind people sometimes when things are important and timely. Repetition is definitely advisable. Third, sometimes good old-fashioned email is the best way to catalyze people to take action. It’s tempting to rely on new media tools to quickly get our message in front of thousands of people (we think) with one click, but as these channels become increasingly crowded, we cannot assume that everyone that is a good fit for our message is going to see it. Balance is key. Use the tools that work, regardless of how ‘new’ they are. Today, I’m very grateful for the efforts of so many people who stepped up and donated to my team’s effort to help provide food and grocery products to those in need in our area. It is very humbling to hold the trust of so many people and watch the donations come pouring in. I must say I was really moved by the outpouring of support in the 2 days leading up to the walk, especially in light of the unfolding disaster in Japan. Often, local charities see a reduction in financial support after a tragedy elsewhere in the world as people tend to donate to international relief organizations. I hope that these organizations are receiving the same level of support that we received during our efforts. 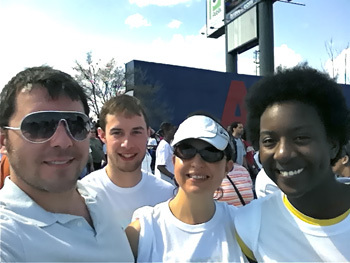 Finally, a quick note about the Hunger Walk itself – we had absolutely perfect weather, as you can see in the pictures. It was 75 degrees and sunny, and the turnout was huge! 2 years ago, the walk was canceled for the first time in its history due to a snow storm. Yep, snow in March in Atlanta. It happens. Last year it was blustery and gray. But this year, total perfection. It’s amazing to watch 12,000+ people come together to participate in something this important to the community. The combined support for a shared goal is quite remarkable. Today, I stand in humble gratitude for the chance to play a small part in the goal of providing food and basic essentials to those in need.